As half of the world's population relies on mountains for their water, 18 indigenous mountain communities call for support to strengthen traditional natural resource management systems. Mountain communities are among the most vulnerable to climate change, with many communities already suffering due to erratic rainfall, drought, increased temperatures and pests, as well as physical instability caused by melting glaciers. 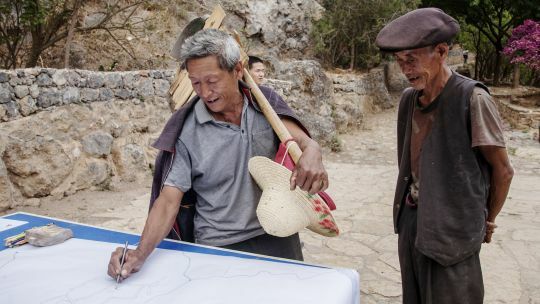 At a recent meeting in the Stone Village, China, 18 indigenous mountain communities from China, Nepal, Kyrgyz Republic, Tajikistan and Peru called for support to strengthen traditional natural resource management systems, especially water management. The Stone Village Declaration stresses the importance of using both traditional and modern practices to provide effective, low-cost solutions for climate adaptation and mitigation, as alternatives to energy-intensive modern technologies. The Stone Village communities have experienced severe drought for the last five years, but have been less impacted than surrounding villages thanks to their traditional water management system that dates back 1,300 years. "A system of channels delivers water fairly to each village, field and household in the valley; this prevents conflicts and ensures social cohesion," says Dr. Yiching Song, senior researcher at the Centre for Chinese Agricultural Policy. However, here, as in other mountain communities, profound social changes are taking place which threaten the continuity of traditional knowledge and resource management systems that provide water and a diversity of resilient crop varieties for climate adaptation. "This traditional water management system is threatened as customary laws are getting weaker; it will soon be lost if we don't act now," observed Alejandro Argumedo, director of the Association for Nature and Sustainable Development in Peru. The declaration, developed by the International Network of Mountain Indigenous Peoples (INMIP), calls for support to strengthen the inter-generational transmission of traditional knowledge, and to develop indigenous products and services and market linkages that support the conservation of biological and cultural diversity. Krystyna Swiderska, principal researcher at the International Institute for Environment and Development (IIED), said: "Half of the world’s population rely on mountains for their water. The Stone Village Declaration sends an important message from indigenous mountain communities that the world needs to hear." The declaration calls on governments and the international community to recognise the critical role of diverse local land races in climate adaptation, and support participatory plant breeding and community-led landscape management, recognising the spirituality that guides it. Signatories to the declaration, including more than 50 indigenous farmers, civil society and research organisations, are hoping that policymakers will take concrete steps to support these recommendations when developing policies and plans for adaptation. Despite the effectiveness demonstrated by traditional resource management systems, indigenous peoples tend to be excluded from research, decision-making, policy and planning for climate change adaptation. Using an innovative 'walking workshop' methodology, farmers shared experiences and key tools for adaptation, including: community landscape management, traditional water management, community seed banks, participatory plant breeding, and the development of biocultural products and services.